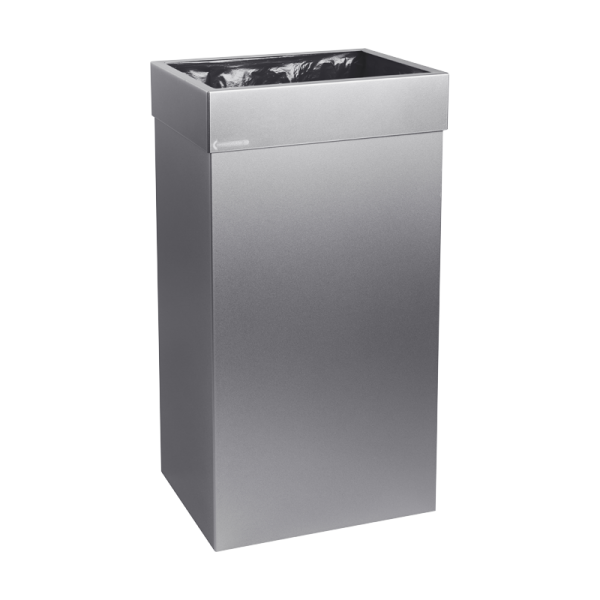 Stylish 100 litre waste bin made from powder-coated steel for indoor use. There is a range of lids available for this bin. Unless otherwise specified in the order, the bin is supplied with a full-width, hide-a-bag top. The bin has wheels, which means that it can be moved quickly and easily without lifting. Designed for a standard 100 litre bin liner. Can be supplied with screw feet instead of wheels. You can also order a wall bracket for retrofitting. To make waste management more efficient, labels can be fitted to the bin in recycling schemes. Can also be incorporated in groups in recycling stations, using special connection brackets. Supplied in standard graphite grey, but is also available in other RAL colours for a small surcharge – either the entire bin or just the top. The bin can also be soundproofed with special plates for use in theatre or cinema auditoriums.